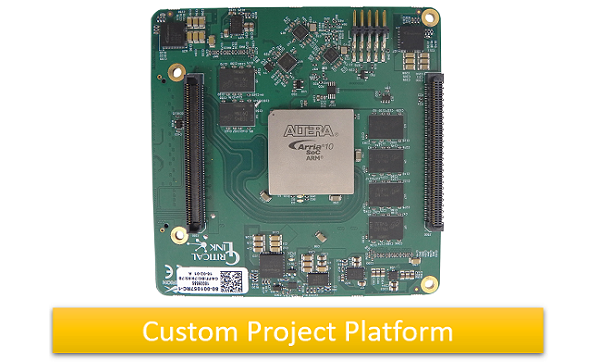 The new Arria 10 SoC board-level solution features dual-side connectors making it ideal for industrial camera designs with advanced image processing requirements. SYRACUSE, N. Y. – July 18, 2018 – Critical Link, LLC, experts in image sensor integration, system-on-chip (SoC) and field-programmable gate array (FPGA) designs, vision protocols, and signal processing, introduces the MitySOM-A10S-DSC processor board for the next generation of embedded imaging applications. The new board features dual-side connectors for stack-through configurations. It is a highly-configurable system-on-module (SoM) featuring the Intel®/Altera Arria® 10 SoC with dual core ARM and up to 480KLE FPGA fabric. The module includes on-board power supplies, two DDR4 RAM memory subsystems, and a rich set of user interfaces. The A10 board supports both OpenCL™ and high-level synthesis (HLS) tools for accelerating design cycles and targeting C/C++ code to the FPGA. Critical Link’s innovative MitySOM-A10S-DSC processor with embedded Linux provides operating system support, versatility, and ease of customization for complex imaging platforms. Applications include machine vision, test and measurement, embedded instrumentation, industrial automation and control, and industrial and medical instrumentation. Critical Link successfully demonstrated a 50MP imaging platform with on-board processing using the MitySOM-A10S-DSC at several trade shows this year, including SPIE Photonics West, AIA Vision, and SPIE Defense & Commercial Sensing. The company is currently developing a series of image sensor boards and interface boards for use with the innovative MitySOM-A10S-DSC platform which will support a wide range of vision protocols including GigE Vision, USB3 Vision, and Camera Link. For more information about Critical Link’s MitySOM-A10S-DSC, please visit: https://www.criticallink.com/product/mitysom-a10s-dual-side-connectors/. To learn more about Critical Link’s award-winning embedded vision products, go to: https://www.criticallink.com/product-cats/imaging/. Additional information about the company’s custom imaging design, product development, and full life cycle engineering support services is available here: https://www.criticallink.com/services/. Critical Link, LLC (Syracuse, NY www.criticallink.com), founded in 1997, develops embedded systems solutions, system on modules (SOMs) and imaging systems for a wide variety of electronic applications. As experts in image sensor technology, system on chip (SoC) and field-programmable gate array (FPGA) design, signal processing, and vision protocols, we support all product development tasks, from concept to final production. Our flexibility allows us to deliver full lifecycle support and services at any step along the product development path. From hardware, firmware, and software development, to prototyping and manufacture/assembly, Critical Link is committed to helping our OEM customers reach their project goals quickly and cost-effectively. Privately held, Critical Link is a Platinum member of the Intel FPGA Design Services Network and Intel IoT Solutions Alliance, and a certified member of the Arrow Consulting Engineering Services (ACES) network.